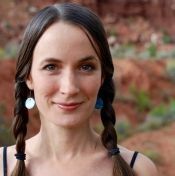 “In yoga classes, the pelvis is often instructed as a single, unbroken unit, which [can] limit our potential to strengthen, stabilize, and mobilize our lower bodies,” says Jonina Turzi, doctor of physical therapy, yoga teacher, and owner of West End Yoga Studio in Lancaster, Pennsylvania. In yoga classes, the pelvis is often instructed as a single, unbroken unit. 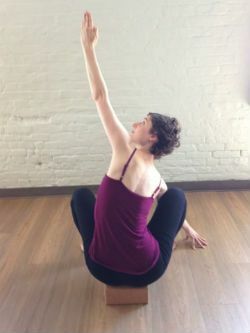 In Turzi’s yoga classes, she emphasizes that pelvis is not one single block, but two distinct halves, interpolated by a cartilaginous disc that divides the right and left pubic bones, and a sacrum that separates the iliac bones. Though bound by strong ligaments, and supported by bilaterally symmetrical muscles, the two sides of the pelvis may do different things, as they do when we walk. By reconceiving of the pelvis as dual, we activate the muscles that help us support the central column of the spine as a unified whole. Turzi prizes the activation of the deep postural or “core” muscles, including the multifidi, the deep fibers of the psoas and the iliacus, the transverse abdominis, the pelvic floor muscles, the obturator internus, the respiratory diaphragm, and the abdominal and intercostal obliques, because they are the ones responsible for creating a spacious environment for the lower body’s organs and joints as well as optimal length in the spine. 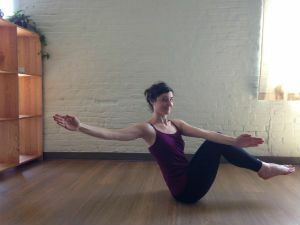 Turzi says, “By identifying the halves of the pelvis in a yoga pose, and giving each side awareness and a unique job to do, we engage and tone these pelvic and spinal core stabilizers, many of which run in diagonals, coordinating reciprocal stability actions in the opposite side of the trunk.” In effect, by reconceiving of the pelvis as dual, we activate the muscles that help us support the central column of the spine as a unified whole. In the sequence below, we can practice distinguishing between sides of the pelvis in common poses which look less like a forward stride, using Turzi’s cue to conjure the leapfrogging actions of the walking pelvis in order to engage pelvic and spinal core stabilizers. Using the ground, the wall, and yoga blocks will give us a clear sense of where the pelvis is in space. 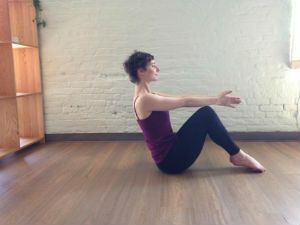 If you discover asymmetry in the pelvic and spinal core stabilizing muscles as you practice, Turzi suggests holding poses a few breaths longer on the weaker or tighter side. Begin lying down. Note if one side of your pelvis is heavier on the earth than the other. Can you root down evenly on both sides? Is one frontal hip bone higher than the other? Can you even them out? Using a strap or your hand, grab ahold of your right foot, and reach it up to the ceiling. Lengthen your left leg on the floor in front of you. Think of the raised right leg as the forward-stepping leg, and lighten the right side of your pelvis on the earth by scooping the right side of your pelvis into a posterior tilt, moving your right sitting bone toward your right knee. Think of your left leg as the “back” leg, and press the left side of your pelvis into the earth, anteriorly tilting the left side of your pelvis by lengthening the left side of your pubic bone toward your left knee and encouraging your upper left thigh bone to settle down toward the floor. Switch sides. Seated on a yoga block, with your toes and knees turned out away from each other, can you root both sitting bones evenly into the block? Then, walk your right fingertips to the right, right arm inside the right knee, and lift your left arm up to the ceiling. Think of your right leg as the forward-stepping leg, and your left leg as the back leg. Root down strongly into the block with your left pelvic bones, and scoop the right side of your pelvis into a posterior tilt, moving the front of your right hip incrementally closer to your navel and your right sitting bone toward your right knee. Change sides. 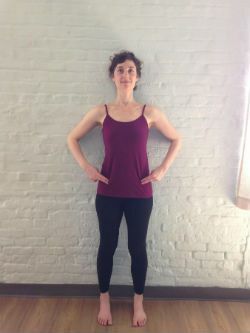 Stand against the wall with your feet hip distance apart and a few inches in front of the wall. Press the back of your head and as much of your sacrum and tailbone as possible against the wall. (Your lower and upper thoracic spine should work toward the wall too, and as much of your shoulder blades as possible.) Is the back of your pelvis evenly heavy against the wall on both sides? Are your hip bones evenly high? Now, make your right foot the standing foot. Bend your left knee, and draw your left foot to the inseam of your right leg (above or below the knee). Think of your left leg as the forward-stepping leg, and lighten your left buttock against the wall by posteriorly tilting the left side of your pelvis, moving your left sitting bone toward your left knee and your left hip-point up toward the navel. Think of your right leg as the back leg, and make your right hip heavier against the wall by anteriorly tilting that side of your pelvis, encouraging the top of the thigh toward the wall, and lengthening the right side of your pubic bone toward the right knee. “Do not worry about getting your bent knee toward the wall,” says Turzi. “Rather, let it point as much to the middle of the room as necessary to keep your right hip heavy on the wall.” Change sides. With your feet a couple feet in front of the wall and hip distance apart, root your hips against the wall and bend your knees, aiming to bring your thighs parallel to the earth. Slanting your spine forward, can you drive both the right and left sitting bones back against the wall evenly? To move into the twist to the right, take the back of your left hand to your outer right knee and stretch your right arm up (or take your left elbow to your right knee, hands together at your heart, for a deeper twist). Think of your right leg as the forward-stepping leg, and posteriorly tilt the right side of your pelvis; this will make your right hip lighter on the wall and bring the right side of your pelvis closer to your navel. Think of your left leg as the back leg, and press the left side of your pelvis more firmly against the wall. Change sides. 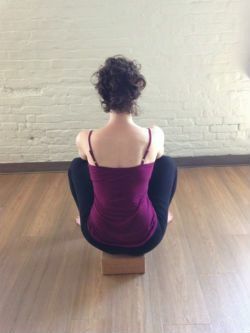 Leaning toward the back of your sitting bones and keeping your ears over your shoulders, lift your shins and feet parallel to the earth (or straighten your legs on a powerful diagonal if you can keep your lower back lifting while doing so), and shift weight from one hip to the other, scooping up one side of the pelvis and then the other. Try to do this without anybody being able to notice, as if you are balancing a jug of water on the top of your head and don’t want to spill a drop. To take navasana into a twist, bring both hands to the outside of your right knee (here toes can be down or shins lifted), palms together. Then, begin to spin your chest to the right, and widen your right arm to the right, broadening across your collarbones. Anchor your left sitting bone into the earth, thinking of your left leg as the back leg and the right leg as the front-stepping leg. The left side of your pelvis then, is in an anterior tilt, pubic bone moving down toward the floor. The right side of the pelvis aims for a posterior tilt, the right sitting bone moving toward right knee, and right frontal hip bone moving toward the navel. Change sides. Lie down, bend your knees with feet on the floor about hip distance apart. Lift your hips and heart up, and interlace your hands below you. Imagine a board under your lifted hips; allow both sides of your pelvis to be evenly heavy on that board, hip bones equidistant from your face. Then, root your left foot into the floor. Float your right knee up until it is directly above your hips. Think of your right leg as the forward-stepping leg in a stride, and scoop the right side of your pelvis up toward your right knee, so that the right buttock is lighter on the imaginary board beneath you, and your right hip bone moves toward your navel. Make your left hip heavier on the imaginary board by anteriorly tilting the left side of the pelvis. Straighten your right leg if you can keep this alignment of the pelvis. Switch legs. From seated, cross your right leg deeply over your left, bringing your right heel outside your left hip; if your left knee doesn’t object, shift your weight to the left sitting bone and fold your left knee so the left heel comes to the outside of the right hip. Think of the right leg as the forward-stepping leg, and root the left side of the pelvis deeper into the earth, while lifting the right frontal hip bone to lighten the right side of the pelvis. Turzi says, “In such a closely bound pose, there won’t be a great deal of actual movement in physical space, but you can feel the effect of the muscular actions.” Change the cross of the legs. Lying on your back, cross your right ankle over the left knee. Before you pull the legs toward your chest, try to make your right hip lighter on the earth as you posteriorly tilt the right side of your pelvis. Ground the left side of your pelvis, as if it belongs to the push-off leg. (Determine to keep your left knee pointing up instead of listing it to the left in your attempts to bring weight to that side of the pelvis.) Keep your pelvic muscles awakened as you move your legs closer to your chest for a deeper stretch. Again, notice the weight of both sides of your pelvis on the earth, shifting your legs if necessary to even yourself out. Then, surrender muscular action: Give in to gravity, first with the right and left sides of the pelvis, and then with the whole body. After a yoga practice in which we practice moving the pelvis much as it moves in the course of an ideal stride, we might feed that muscular intelligence back to our stride, consciously allowing one side of the pelvis, and then the other, to move forward and up, and even to the side, in order to step its foot forward, and so find new ease in gaits that may have become inhibited by sedentary lifestyles. “When we allow the pelvis to dance around the sacrum as we walk, every step becomes a massage to the vital pelvic organs, and an aid for digestion,” says Turzi. When the pelvis is liberated, we flow on its waters. A pelvis that functions as a composite of mobile parts, rather than as a block, is better able to engage the muscles that will buoy the bones and organs above, making it a fitting dwelling place for svadisthana chakra, the energy center associated with fluidity and adaptability. “When the pelvis is liberated, we flow on its waters. The tailbone can move like a flagellum,” Turzi says, conjuring an image of the primordial flickering that propelled some of the first organisms through the fluid beginning of life on this planet.